Kiddie Koop Children’s Enrichment Center has educated thousands of children since 1978. It was founded by Linda Kostantenaco, a parent of two wonderful children and 5 marvelous grandchildren. She has been active in local, state, and national issues in the early childcare and education industry. Kiddie Koop programs contribute to your child’s development, self esteem and confidence! Linda is currently on the Board of Director’s of the National Child Care Association; Texas Licensed Child Care Association and is a Master Verifier/Trainer for The National Early Childhood Program Accreditation Commission. Linda’s strong dedication to providing a well rounded quality environment that provides children with first class early development education has always been her ultimate goal. Our children’s enrichment center focuses on problem solving, decision making and self-help, while promoting interpersonal communications. These are key elements which contribute to the child’s development, self esteem and confidence. Kiddie Koop is accredited by the National Early Childhood Program. Kiddie Koop has also has the distinction of being awarded the Texas Readiness Certification “Ready For School – Ready for Life”. Our center works hard to stay posted on the most up-to-date teaching methods. We are continuously updating our curriculum but maintain basic methods that we believe nurture children’s early learning. Our methods are exemplified in the activities we do with the children. 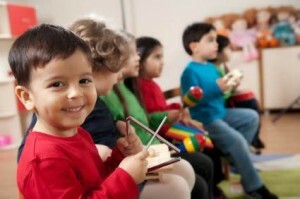 Kiddie Koop kids enjoy plenty of fun learning activity time, such as music and movement! We believe children learn by doing things themselves and provide them with an endless amount of enthusiasm as well as tools to explore with. Our center is filled with toys, games, musical instruments, books and computers. Each week, you will receive a newsletter from your child’s teacher so that you are kept updated on what your child will be learning. There will be parent activities that you will be asked to participate in so that your child’s learning experiences will make a connection between the classroom and home. We provide professional development to management and staff by attending early learning workshops, seminars, childcare conferences, webinars, and other on line training which is a vital part to issues related to what we are teaching the children. We are always excited to meet new families. Please call (830) 980-7671 to schedule a tour of our wonderful childcare center or come visit us at 28190 Hwy 281 North, San Antonio, Texas 78260.